Have you ever had a tight throat as you tried to speak your truth? What about when you spoke in public? Have you ever gotten a sore throat after a long day where it was hard to take good care of yourself? Have you felt a vocal strain after yelling at someone? Have you ever been a bystander of an unkind act or overheard some false gossip and felt terribly guilty afterward? Your fifth chakra is about the power of expression. It’s your communication center. This is the place where you develop your spiritual voice. Your truth and your will manifest here. This is also the center where you receive and assimilate information. This chakra is about being inspired, feeling creative, and your ability to honor that inspiration and creativity. Integrity is key here. 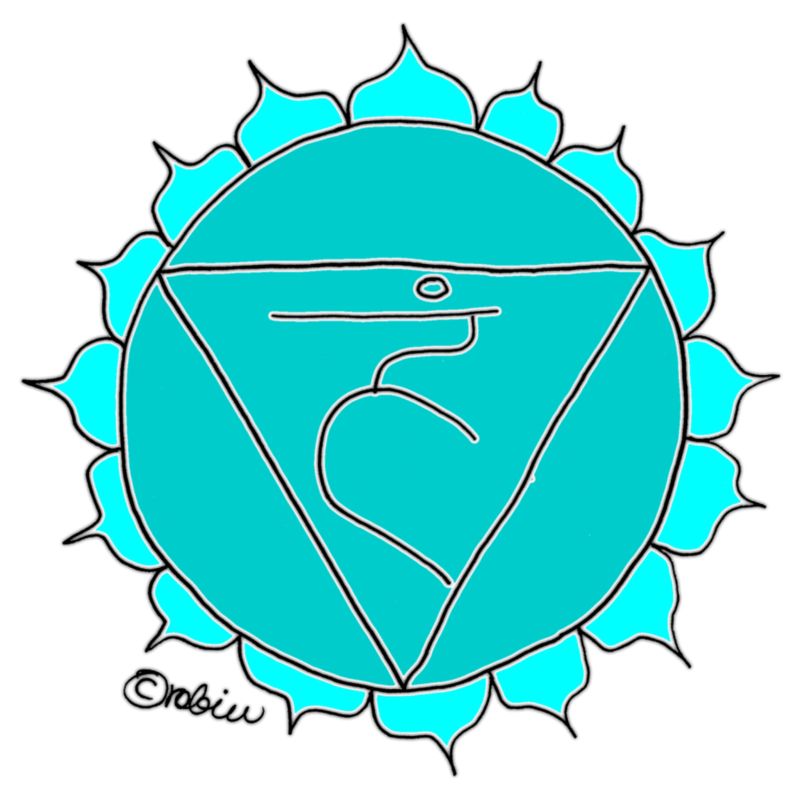 About the symbol for this chakra: The color of this chakra is sky blue, recalling the expanse of the heavens. It’s symbol is shown as a flower with sixteen petals. The Sanskrit word Vishuddha means “the pure place”. What kind of thought and feeling “stuff” is this chakra affected by? This is your center of expression. Anything you believe, feel, think is a form of expression–whether you say it out loud or not! The biggest tip I can give you around this chakra is to become interested in your longings and desires. How can you be kinder, softer, and more gentle with yourself? What can you do to make space for yourself to express whatever it is you feel you’re called to do? Choices you make: Many choices are made in this chakra out of fear. There is a powerful energy here that does not want to betray the tribal code (see my first chakra post for more on that). So you may be a very creative, insightful, inspired person but STILL have a fear and lack of confidence that actually is brought about by your fear of breaking the family code. Attitudes, beliefs: What is your outlook about life and your possibilities in the world? How do you view things like success, wealth, power? What do you really think about people? I am talking about your inner attitudes and beliefs-not what you speak out loud. Most of the time we censor as we speak. Judgement: It’s time to become conscious about the way we judge ourselves and other people. What if you could allow people to be who they are, and also give yourself permission to be all that you are as well? Wouldn’t that be lovely? You can practice giving people the blessing when you catch yourself being judgmental. Give yourself the blessing whenever you feel you’re being hard on yourself. Gossip: Are you a gossip? Do you speak unkindly about people? Are you nice to someone’s face, and then roll your eyes as they walk away? Have you stood by while someone spread a rumor but you didn’t say anything to stop it? I’m not asking you this to make you feel bad, I want to help you become aware that this kind of thing is very disempowering to you and to the spirit of the person being discussed. Whatever you do to someone else, you are doing to yourself. Nobody is perfect, but wouldn’t it be nice if you could make it a practice to have integrity with your word and the words others speak in your presence? Speaking the Truth: How often do you actually speak your truth? When things are hard to say, but must be said, do you honor your voice? Is it easier for you to go with the flow than it is to make waves? We often agree with others not because we want to but because we’re afraid. This builds up a resentment and causes a loss of power. What can you do to support this chakra? Make a conscious choice to not judge others so quickly. Judgement actually chokes you. No wonder it is so hard for us to make strides into our own creative endeavors! We’re being choked by our own fear and judgement! To the best of your ability, stop gossiping, spreading rumors, and tearing other people down. Make it your new policy to have compassion for yourself and for others. This is going to speed up your journey! Think of it like swimming upstream when you are going against your spirit. Isn’t it just easy and delightful to float merrily down the stream? By the way, there really is no “other person”–we are all one. Whatever you do to someone else, you are doing to yourself (my meditation teacher used to call it: buy one get one free!!). Just imagine how sweet your life could be if you practiced nurturing, encouraging, supporting, blessing and celebrating yourself!! Woo hoooooo! What healing exercises can you do to help this chakra? If you’ve worked with me, you probably know I am a big fan of a Hawiian forgiveness ritual called Ho’oponopono. This word means ‘to make right’. When spoken with sincerity and intention, the energy that needs cleaning can be healed. I love you, I’m sorry, Please forgive me, Thank you. Light a candle, and say it as often as feels right. If you had a few ah-ha! moments reading this and you’d like some help exploring further, get in touch with me. I’m here for you.